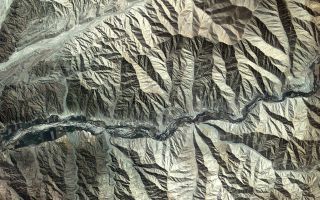 The foothills of the Andes Mountains near the southern coast of Peru were captured by the Kompsat-2 satellite, as seen in this cool space wallpaper. The foothills of the Andes Mountains near the southern coast of Peru were captured by the Kompsat-2 satellite, as seen in this cool space wallpaper. The Andes stretch from Venezuela down South America’s west coast to the top of Argentina. The mountain rage is the result of the Nazca and Antarctic tectonic plates moving under the South American plate—a geological process called subduction. This process is also responsible for the Andes range’s volcanic activity. This image was released July 5, 2013.